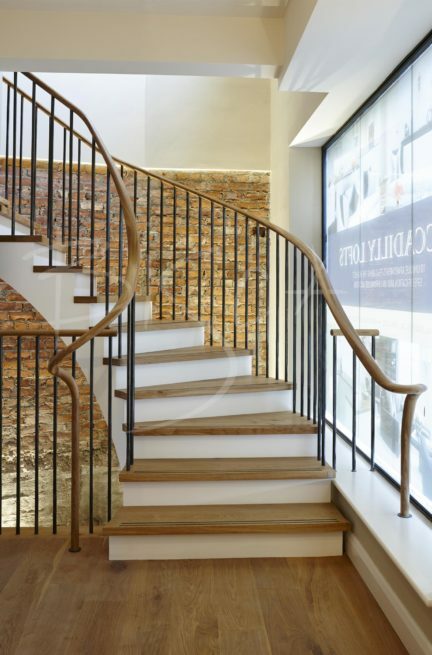 An industrial style staircase in a converted car showroom in York. In 2014 Bisca were commissioned by Northminster Ltd to work alongside Rachel McLane Interiors and COG Architects in the conversion of a 1930’s car showroom in the heart of York into prestige, residential loft style apartments. 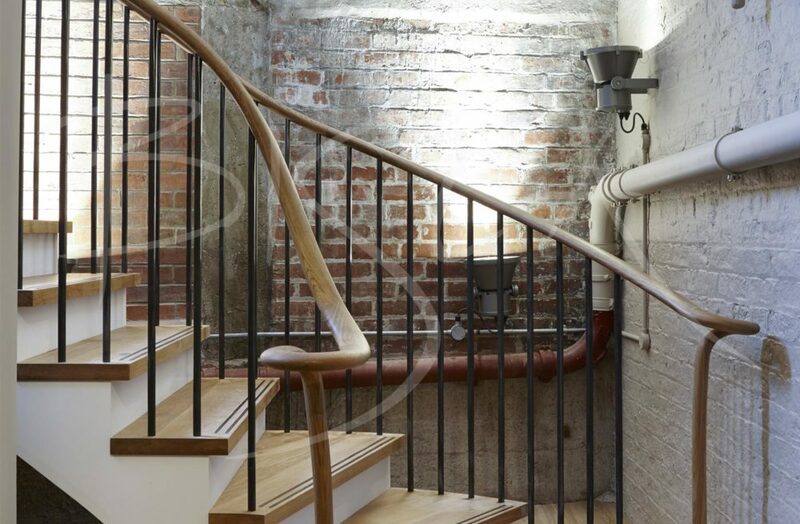 In keeping with the industrial heritage of the building the main common areas staircase, from basement to ground and ground to first, was carefully designed to be part of the property in its new chapter. Visible from Piccadilly at street level, the staircase is showcased in a huge feature window at ground floor, so the design had to be both stunning and functional. 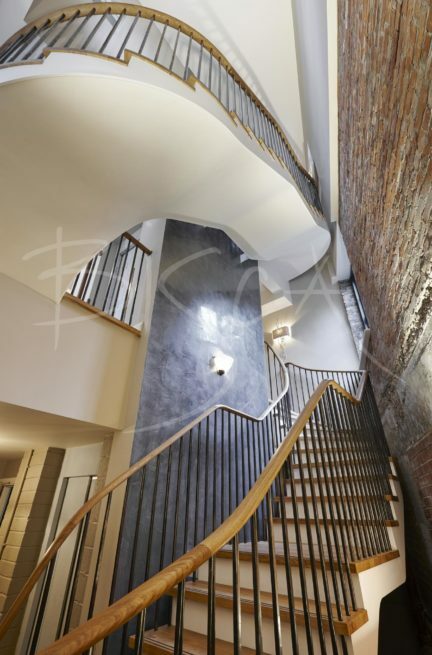 As the apartments at the Piccadilly side of the property were fitted with oak units and oak flooring, hardwearing treads of fumed oak were the obvious choice for the staircase timber. The inlaid tread detail provides a non-slip function as well as adding interest. Closed treads and risers are supported by slim and elegant steel structures and sweeping plastered soffits, contrasting wonderfully with the warmth of the exposed brickwork. The balustrade is of hand forged, formed and textured uprights capped by a tactile hand carved oak handrail. 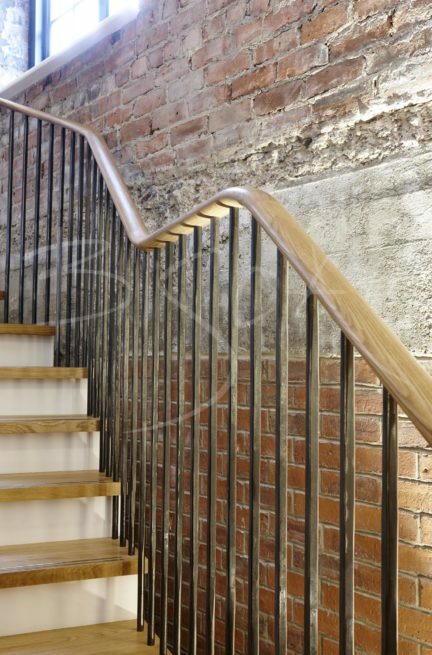 Bisca have gained a reputation as specialists for staircases in listed or period properties, and were proud to be part of the winning team at the 2015 York Design Awards, where Piccadilly Lofts Staircase won the Judges Special Award for detail design and craftsmanship. For enquiries about this staircase, or to get a guide price for your project based around a design like this, please quote reference 4339.